I still sometimes find it strange to be writing about the need for accessible railways stations in 2018. Believe it or not though, there are 104 railway stations in Scotland that are not fully accessible. By that I mean where there is no access to the rail platform/platforms by means other than only steps. Whether it be a ramp or a lift there are far too many stations that do not have full access. Whilst this makes the railway network all but impossible to access for some - particularly anyone with mobility restrictions, it also makes some platforms extremely difficult to access for those with prams, buggies and heavy suitcases. There are so many railway stations that have had upgrades and when you are not restricted in mobility it makes it all to easy to overlook the fact that many struggle to access trains. 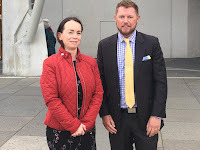 Earlier this week I had a meeting at the Scottish Parliament with the Shadow Secretary for Transport, Jamie Greene MSP. 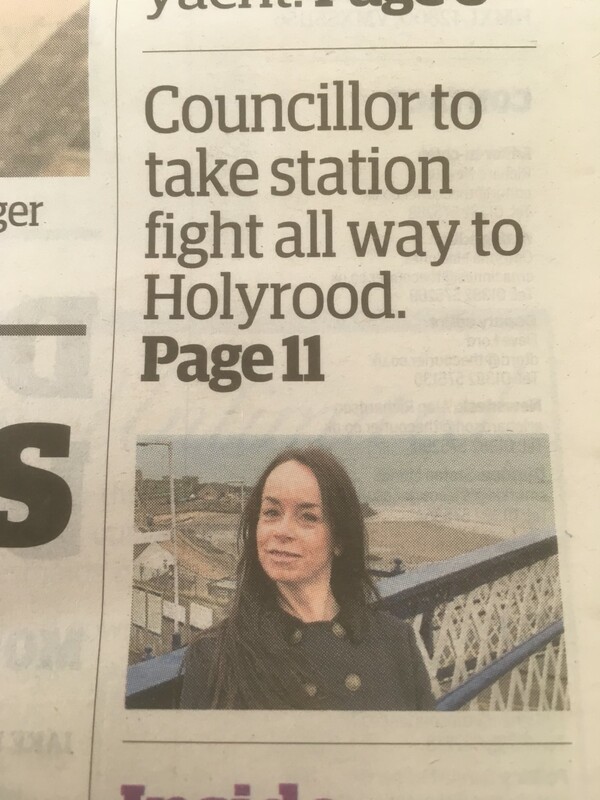 I wanted to raise the specific issue at two railway stations in the area I represent - Burntisland and Kinghorn. There is no accessibility to the northbound platform at Burntisland for wheelchair users and no access to the southbound platform at Kinghorn for wheelchair users. If you have accessibility restrictions you have a choice - you don't alight in Burntisland but instead stay on until Kinghorn or Kirkcaldy and then by a long and complicated (and what seems) a not particularly efficient process you have to arrange to have a taxi collect you. 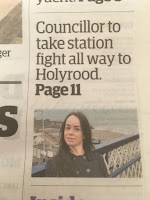 By the same token if you are travelling south and live in Kinghorn you can alight in Kirkcaldy or Burntisland and then go through the whole call a taxi thing and wait until one turns up. Fair? I don't think so. If you are a wheelchair user you could also take the option of staying on the train until Kirkcaldy then use the underpass and head back down the line to Burntisland and alight on the southbound platform. What happens though if you have been enjoying a night out in Edinburgh and get the last train? Maybe you can't get a train back from Kirkcaldy. I guess that means you leave your night out early and take an earlier train. Astonishing, right? Quite simply this is unacceptable. Or you may be disabled and drive to Burntisland Railway Station, park your car and take the train to Edinburgh. However, on your return journey you won't be returning to the station of origin and getting in your car to go - because if you are a wheelchair user there is no possibility of leaving the northbound platform. At all. An absolute disgrace and completely unacceptable. A meeting was held of the Burntisland Community Development Trust (BCDT) last month to begin the process of reestablishing a campaign for an accessible railway station. To the meeting I took the feedback Transport Scotland had sent me. 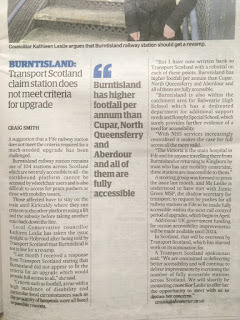 Their "reasons" why Burntisland does not fit their criteria for an upgrade. Completely dissatisfied with their reasons/excuses I wrote back to them and provided a rebuttal to their claims (see below). 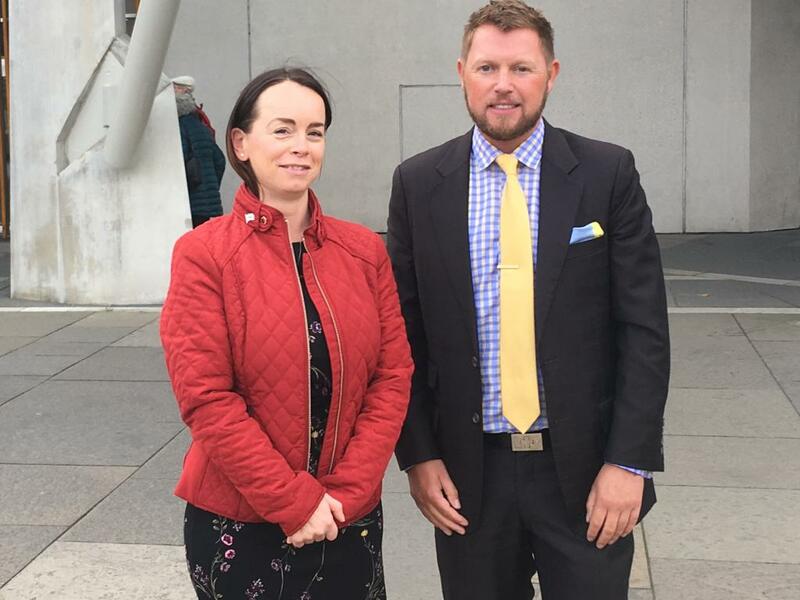 When I met with Jamie Greene MSP I wanted to highlight the situation in Fife with some railway stations but specifically in my Ward and see what could be done to try and push for some focus on this. The Devolved and Reserved aspects of the railway network in the UK come into this - what I do not want though is the usual Scottish Government "its all Westminster's fault" nonsense as this is an issue which the Scottish Government through Transport Scotland can seriously look to address. There is money in the budget to cover all of these but the funds are obviously infinite. What I did say though was that in terms of an upgrade, Burntisland is less complicated than many railway stations - there is an old ramp behind the wall on the northbound platform and there is also a tunnel under the railway line. Therefore, there is some basic, albeit old, infrastructure already in place. I also learned that there is a fund known as the Squire Fund which was established to collect revenue where Scotrail had had to pay performance penalties - due to late trains, cancellations etc. The fund can be used to deliver improvements such as "station shelters, train doors, train toilets and train announcements" (Scottish Government statement). What I was angered to hear though was that the Scottish Government used some money from this to issue free rail travel to passengers who had experienced delays. All in all I felt the meeting was positive due to the action points brought about from it. These include Jamie Greene MSP to table a question for the Scottish Government on the need for fully accessible railway stations - this will happen on 4th October. 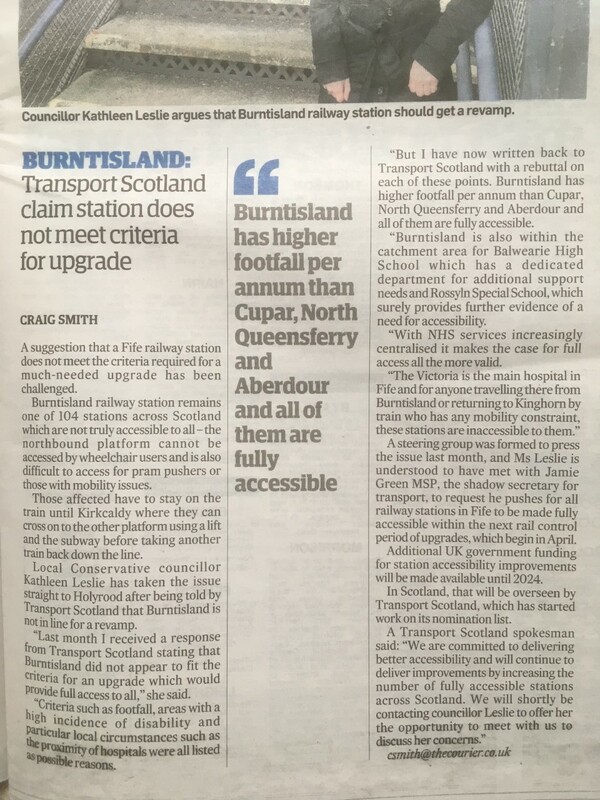 Additionally, through my press campaign and my disappointment at Transport Scotland stating Burntisland Railway Station did not meet the criteria for an upgrade they have now requested to meet with me to discuss further. Watch this space. If you have been affected by inaccessible platforms in Fife then do please get in touch. Responses to the assessment criteria rationale. 1. Footfall – Burntisland has a higher level of footfall than several other stations in Fife. Looking at the below table which I have put together – data shows usage of stations on the East Coast line where it passes through Fife and/or the Fife Circle. 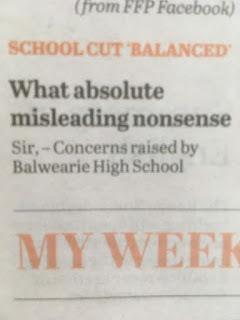 On this basis I do not feel Burntisland misses the assessment criteria. 2. Stations where there is a particularly high incidence of disability – Can you further clarify this? Is this based on a percentile of the town? I would find it rather strange for Burntisland to have data that would be far removed from the level of disability in other towns. Can you please also clarify your definition of disability? Does this purely relate to mobility or across all spectrums of disability? 3. A particular local circumstance such as the proximity of hospitals, a school for disabled children or a military rehabilitation centre – The only station that would be in proximity to a larger hospital would be Kirkcaldy. Cupar and Glenrothes have smaller hospitals. However, in Fife more and more services are based at the Victoria Hospital in Kirkcaldy - some medical services previously offered in Burntisland have relocated to Kirkcaldy. Schools for disabled children, please see below data. · Please note - ** Rosslyn School is a special school within Viewforth High School and Balwearie High School (catchment high school for Burntisland) has a dedicated Department for Additional Support (DAS) - both of these schools are in Kirkcaldy. In Fife, pupils in a special school or a DAS are provided with transport to and from school. Additionally, pupils at both Rosslyn School and Balwearie are drawn from across the Kirkcaldy area – which incudes Burntisland. Therefore, there are two schools which support pupils with additional support needs (ASN), some being complex needs, within the Kirkcaldy area and therefore, Burntisland. 4. Availability of third party funding – Can you please provide detail on what third party funding (if any) went into the upgrades to other stations within Fife (both on the Fife Circle and the East Coast line). 5. 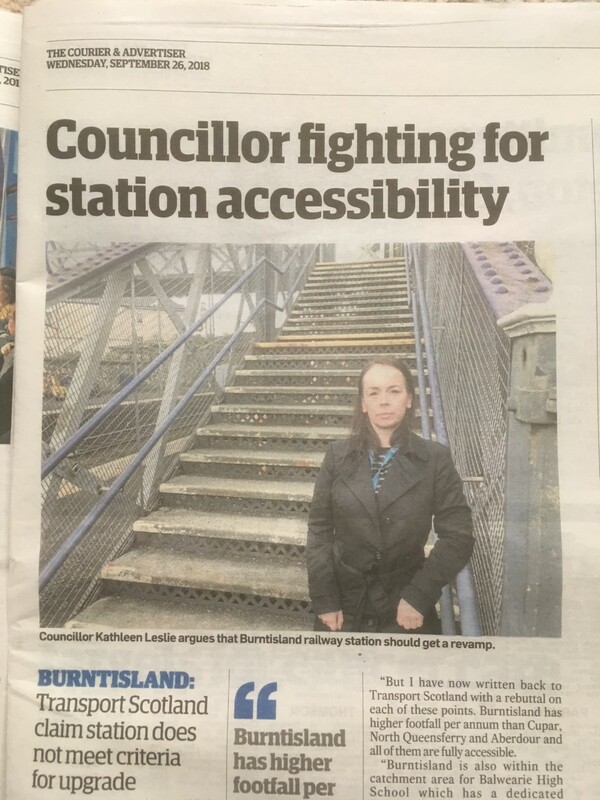 Stations what would help to fill “gaps” in accessibility in the network – Burntisland is inaccessible to rail users with a disability which affects mobility on the northbound platform. Kinghorn (the next station on the line) is inaccessible to the same group, but on the southbound platform. I look forward to a more detailed explanation to the criteria that has been set. Can you also please confirm that if the Department for Transport develops the assessment criteria and Transport Scotland “are required to submit proposals based on a criteria set by them” - who makes the decision as to which stations receive upgrades? Is the final decision down to the Department for Transport or does Transport Scotland provide a list as a cursory measure whilst already having made the decision? Can the Department for Transport reject a Transport Scotland proposal? Additionally, what percentage of funding from CP6 is allocated to Scottish railway stations? Can you provide me with the formula? Budget Savings - School Cuts - Number One Priority? 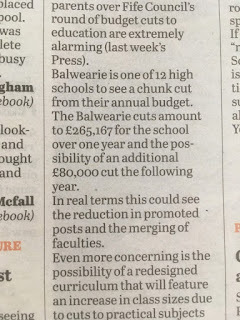 Over the past number of weeks increasing concerns have been voiced by staff, parents and some Councillors about the impact of draconian cuts to high school budgets in Fife. Of 18 high schools in Fife, 12 are facing cuts to their budgets with further cuts being likely next year. Let us keep in mind that this is all whilst the SNP Government at Holyrood continues to parrot its line of education being its "number one priority" - all beginning to look rather hollow now. Figures released this week show only 7% of schools make their performance information available to parents - only 6 in Scotland fully meet the requirements on providing curriculum and attainment data. This is not good enough. More concerning is that the number of exam passes has fallen at the fastest rate since records began. Yet we continue to be assured by this SNP Government that all is good in education. 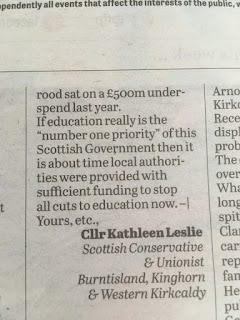 Cuts to secondary school budgets in Fife are going to hit and they are going to hit hard. Cuts mean the possibility of departments closing, a reduction in practical subjects, reduction in subject choice and ongoing uncertainty for teachers, headteachers and most importantly, pupils. 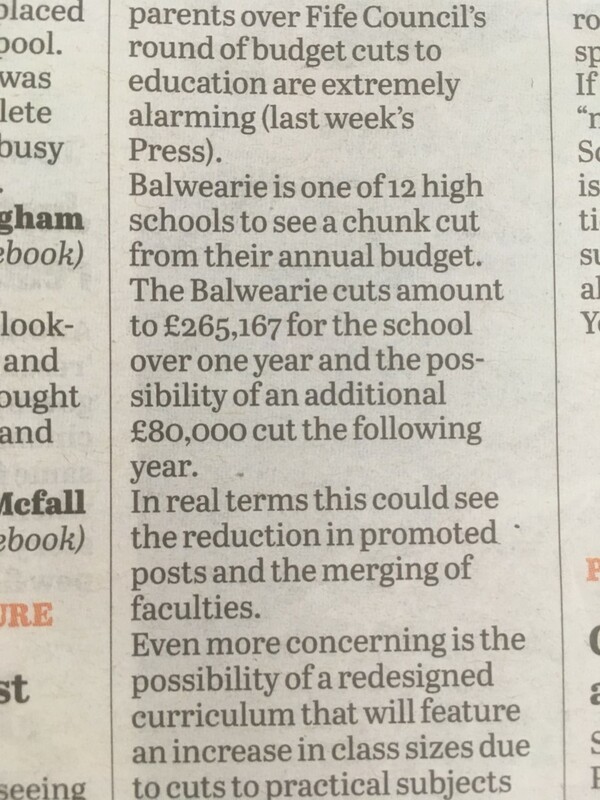 In response to cuts to the high school in my Ward, Balwearie High School, I wrote the following letter for the local paper. This issue needs to be continued to be pushed. Fife Council's SNP-Labour Administration passed this budget with little or no information that indicated this would be the impact on schools. The blame lies firmly at the door of the SNP at Holyrood who are sitting on a £500million underspend, thus starving local authorities of much needed cash. Labour in Fife though appears to be scared to tackle this, sits silently and instead leave criticism to their MSPs at Holyrood. Very disappointing for a party which clearly has had a good track record in the past with education in Fife. Further scrutiny is required and more questions need to be asked. This simply is not good enough. Every week I receive emails from concerned parents (and the occasional) teacher about upcoming cuts - people are concerned and rightly so. The SNP have tried to talk up the Pupil Equity Fund (PEF) as the great saviour brought in by their Government at Holyrood as a way to offset these cuts. This is complete nonsense, PEF addresses a different need and targets specific groups and is based on free school meal ratios - it does not provide money for permanent teaching staff - ultimately schools need teachers and teachers who can teach across the curriculum. No fancy project will eliminate the attainment gap unless you have the staff and subjects there for pupils to realise their full potential. 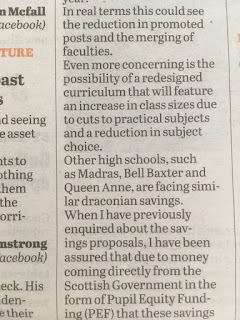 At this stage I am awaiting a response from the Education & Children's Services Directorate on the formula applied to reach the budget savings in high schools in Fife. 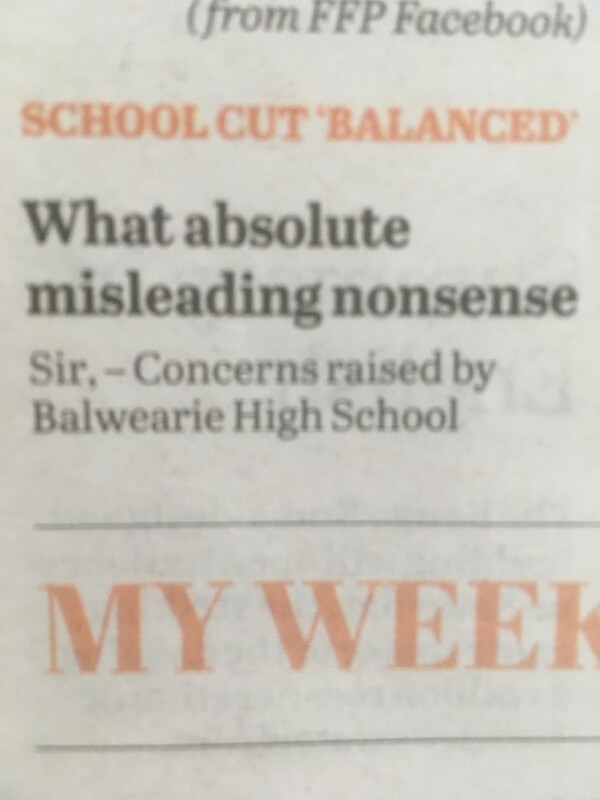 Concerns raised by Balwearie High School parents over Fife Council’s round of budget cuts to education are extremely alarming (FFP 6/9/18). Balwearie is one of 12 high schools to see a chunk cut from its annual budget. These cuts amount to £265,167 for the school over one year and the possibility of an additional £80,000 cut the following year. In real terms this could see the reduction in promoted posts and the merging of faculties. Even more concerning is the possibility of a redesigned curriculum that will feature an increase in class sizes due to cuts to practical subjects and a reduction in subject choice. Other high schools such as Madras, Bell Baxter and Queen Anne are facing similar draconian savings. 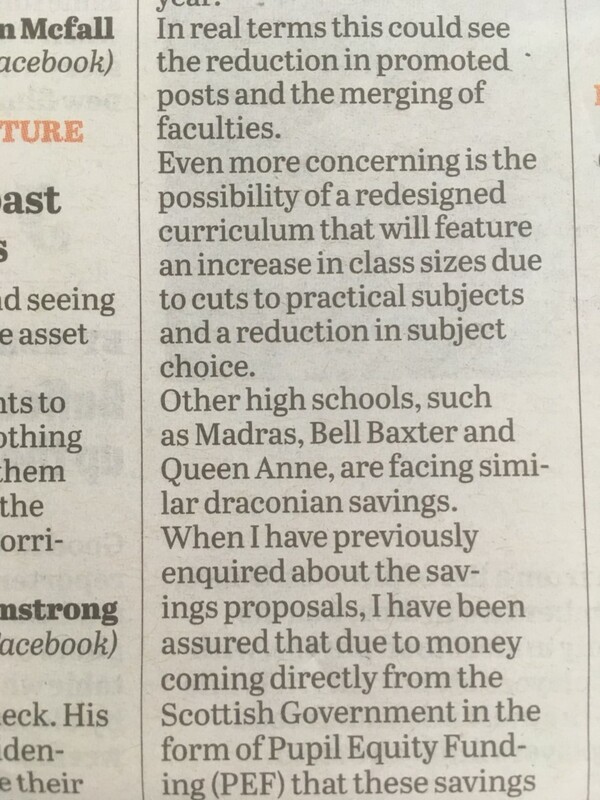 When I have previously enquired about the savings proposals I have been assured that due to money coming directly from the Scottish Government in the form of Pupil Equity Funding (PEF) that these savings will be balanced out. What absolute misleading nonsense. 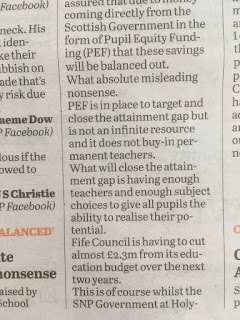 PEF is in place to target and close the attainment gap but is not an infinite resource and it does not buy in permanent teachers. What will close the attainment gap is having enough teachers and enough subject choices to give all pupils the ability to realise their potential. Fife Council is having to cut almost £2.3 million from its education budget over the next two years. This is of course whilst the SNP Government at Holyrood sat on a £500 million underspend last year. 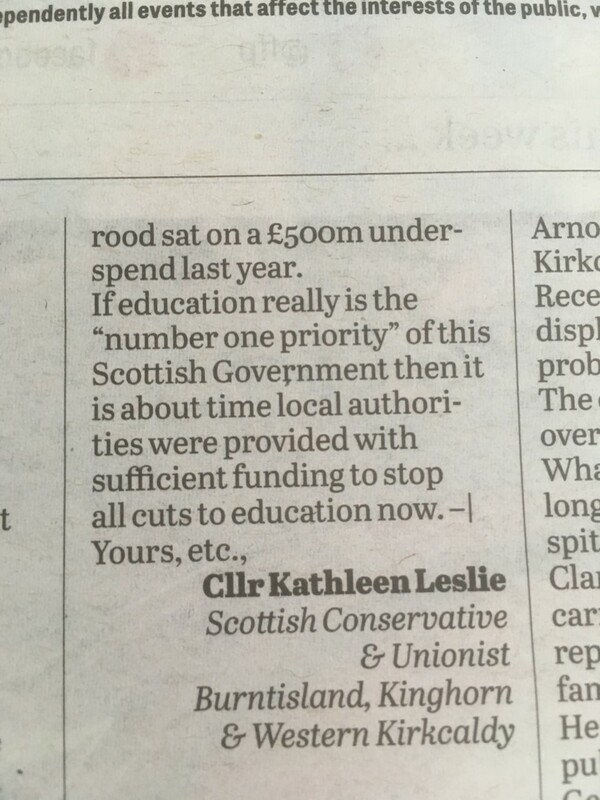 If education really is the “number one priority” of this Scottish Government then it is about time local authorities were provided with sufficient funding to stop all cuts to education now. 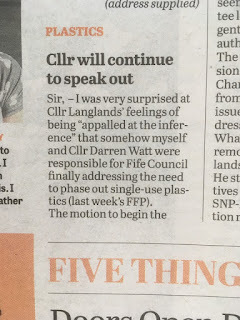 A couple of weeks ago I wrote here expressing my astonishment at a swipe from a Labour Councillor about the motion raised by Cllr Darren Watt and myself to eliminate single-use plastics from Fife Council. 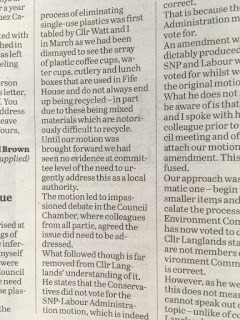 The councillor who did this claimed that initial moves to eliminate single-use plastics had nothing to do with the motion by Cllr Watt and I and that we were claiming success that was not ours to claim. 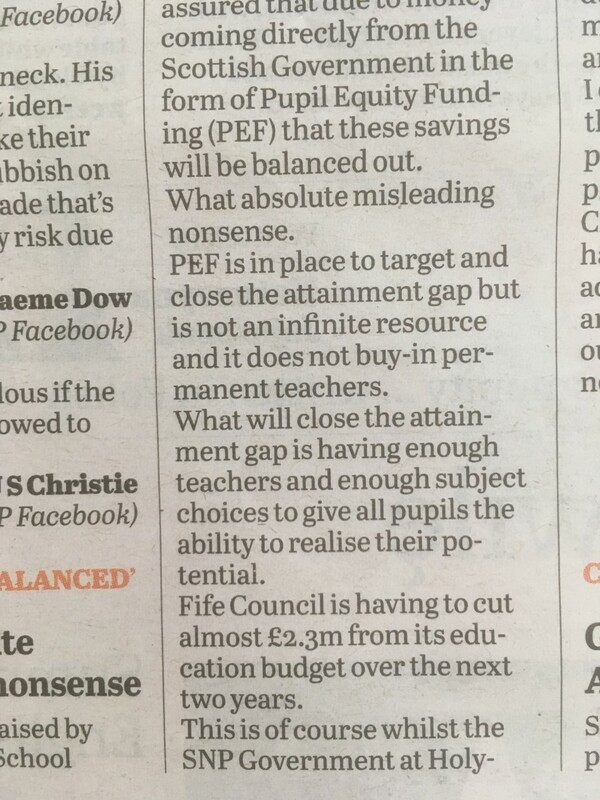 Last week I responded to this in the Fife Free Press (see below). As I have reiterated time and time and time again - the elimination of single-use plastics is something that we ALL must be working towards. I have spoken out on this in Council, at Community Council meetings, at school parent council meetings, in the media and on social media. I am a long time environmentalist and am frequently horrified by the amount of plastic packaging I find on products in supermarkets, at the amount of single-use plastics I see thrown into landfill bins, the littering of plastics along our coastlines and most of all - the absolutely horrendous impact on marine life as a result of the discarding of these products. I will continue to work towards a single-use plastic free environment. All of the above is why I was so outraged at the suggestion being made that somehow I was not so committed to this and had voted down a motion to eliminate single-use plastics. I most certainly did not. 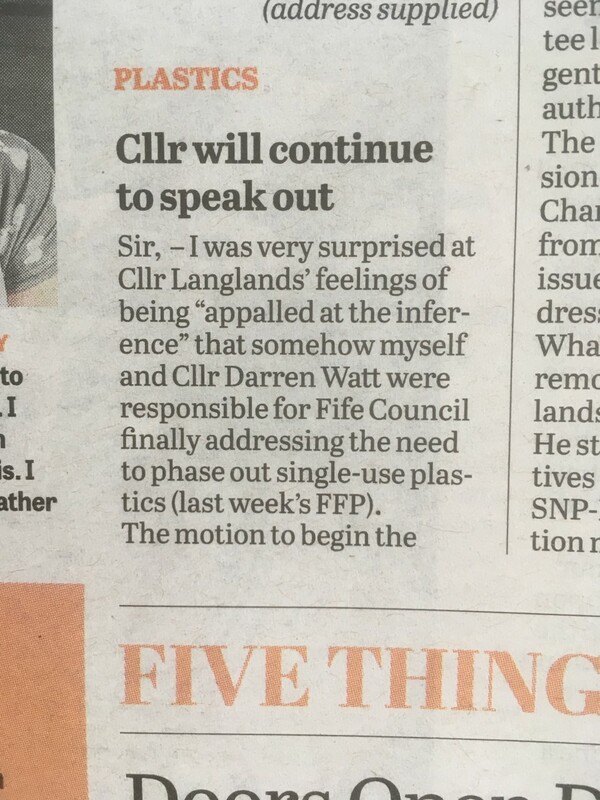 I was very surprised at Cllr Langlands feelings of being “appalled at the inference” that somehow myself and Cllr Darren Watt were responsible for Fife Council finally addressing the need to phase out single-use plastics (FFP 30/8/18). 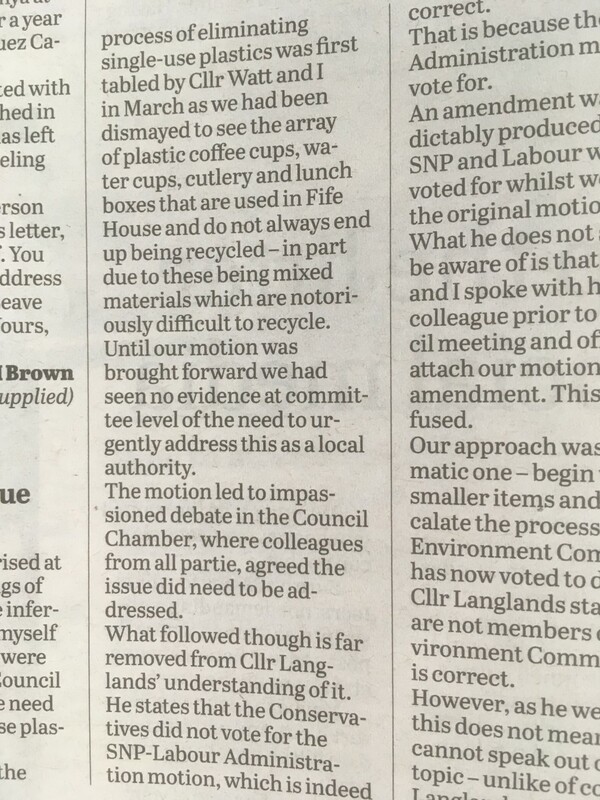 The motion to begin the process of eliminating single-use plastics was first tabled by Cllr Watt and I in March as we had been dismayed to see the array of plastic coffee cups, water cups, cutlery and lunch boxes that are used in Fife House and do not always end up being recycled – in part due to these being mixed materials which are notoriously difficult to recycle. Until our motion was brought forward we had seen no evidence at Committee level of the need to urgently address this as a local authority. The motion led to impassioned debate in the Council Chamber, where colleagues from all parties, agreed the issue did need to be addressed. What though followed is far removed from Cllr Langlands understanding of it. He states that the Conservatives did not vote for the SNP-Labour Administration motion, which is indeed correct. That is because there was no Administration motion to vote for. An amendment was predictably produced by the SNP and Labour which they voted for whilst we voted for the original motion. 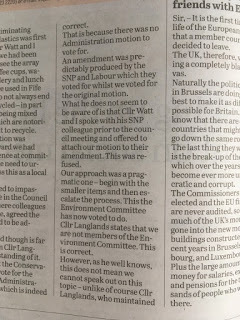 What he does not seem to be aware of is that Cllr Watt and I spoke with his SNP colleague prior to the Council meeting and offered to attach our motion to their amendment. This was refused. Our approach was a pragmatic one, begin with the smaller items and then escalate the process – which the Environment Committee has now voted to do. 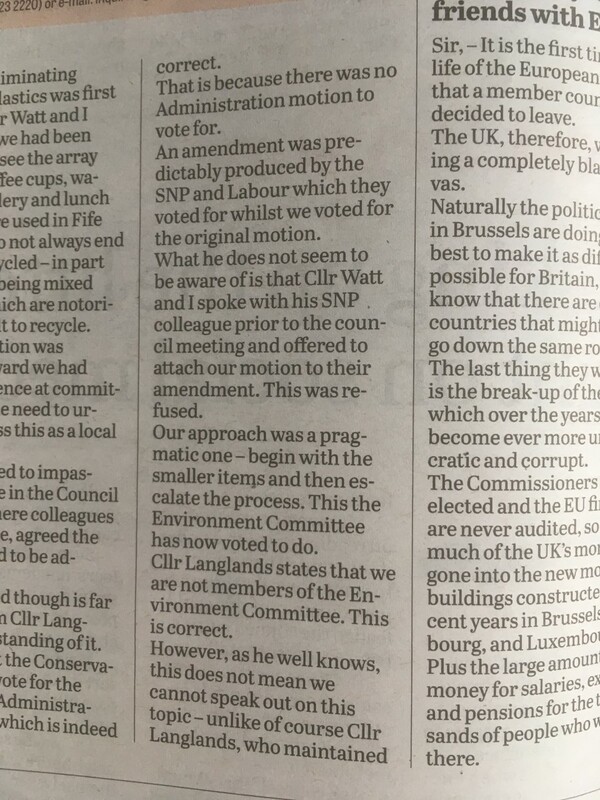 Cllr Langlands states that we are not members of the Environment Committee, this is correct. However, as he well knows this does not mean we cannot speak out on this topic. 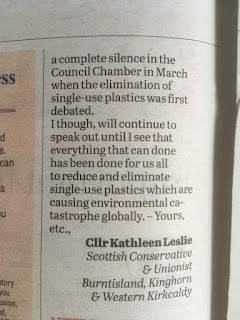 Unlike of course Cllr Langlands, who maintained a complete silence in the Council Chamber in March when the elimination of single-use plastics was first debated. 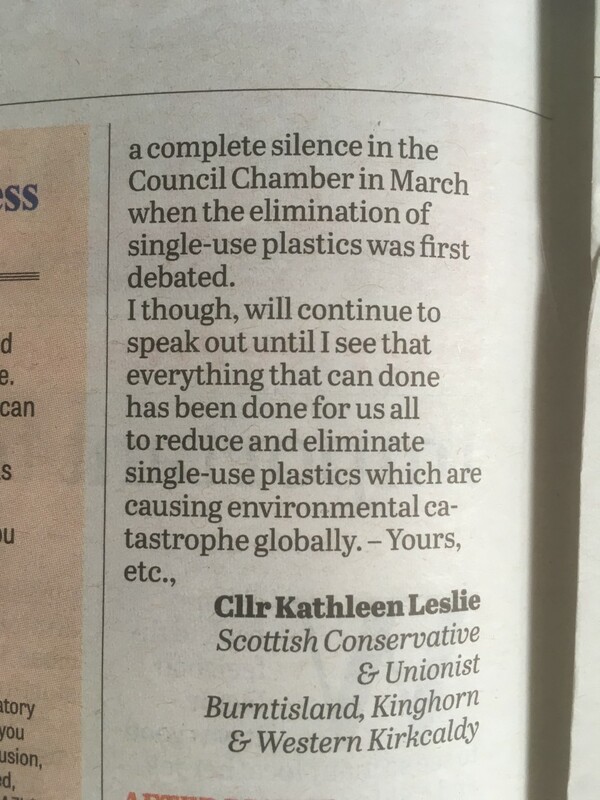 I though, will continue to speak out until I see that everything that can done has been done for us all to reduce and eliminate single-use plastics which are causing environmental catastrophe globally.